The room was nice and quiet with black out curtains. The pool was warm and clean. The breakfast was good. Beds were comfortable. Location is awesome! Convenient location for our needs; very friendly front desk staff; comfortable beds; clean room and a good breakfast. Very convenient and pleasant. We appreciated the beautiful area. It was a very pleasant stop on the way back to Colorado. Checking in was quick, easy access to the kitchen and pool, checking out was even quicker. The only drawback was that Monticello UT does not have a lot of choices for meals. We will be back! Great staff, very friendly. Check in was easy and fast. The room was a little old and worn but clean. Gray location to the park. Good restaurant attached to the motel. As we travelled through southern Utah national parks, this hotel is placed well to stop after a day at Cantonlands on our way to Monument Valley. Everything was clean, organized and well maintained. We left early before the town awoke so I don’t have anything to add about Monticello, UT. Very friendly & helpful front desk staff. Room was basic but very clean and comfortable. Hot tub and pool are EXCELLENT. Would definitely stay here again! If you are targeting Monticello, this is you’re best option...by far! Value for the money and location--nothing near by but the Canyon Lands national park: Not updated, but decent size room, clean and well maintained, basic breakfast, nice indoor pool. We found the hotel to be clean, comfortable and in a great location for getting into the Needles section of Canyonlands NP. There were deer outside the hotel each morning and evening and the view of the mountains was great.There were not many options for dinner, however. Best option in Montecillo. Continental breakfast was bland but accommodations were fine. The staff was very friendly, we felt welcome the moment we walked in. The let us check-in almost on our earlier. Only complaint I have is that the A/C in the room was extremely noisy and I was unable to open the windows. Pool looked nice and clean, didn't get a chance to go in though. The hotel is a little older, you can tell (old carpet in the hallway, no elevator). Still, I recommend it. We were on our way to CanyonLands National Park. This hotel was great. Perfect location. Clean, great pool hot tub area. Definitely would stay again! Stayed in this hotel in order to hike Canyonlands-Needles section, namely the Druid Arch trail this time. 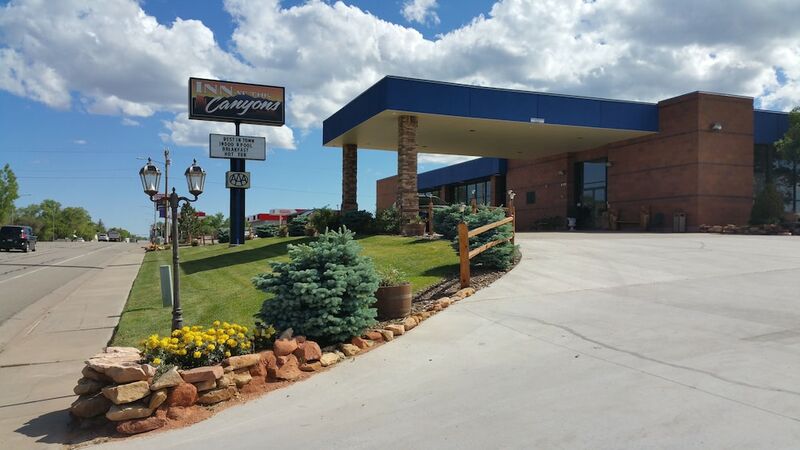 Inn at the Canyons places you within a short walk of Frontier Museum and within a mile (2 km) of Millsite Trail. This 43-room hotel welcomes guests with free breakfast and conveniences like an indoor pool and free in-room WiFi. Start your day off right with a free continental breakfast. A 50-inch TV comes with cable channels, and guests can stay connected with free WiFi and wired Internet. Other standard amenities include a refrigerator and a microwave. Guests staying at Inn at the Canyons enjoy an indoor pool, a spa tub, and free WiFi in public areas. If you decide to drive, there's free parking. Front-desk staff are standing by 24/7 to assist with any requests. Additional amenities include a business center, coffee/tea in a common area, and a convenience store. The hotel has an indoor pool and a spa tub. The preferred airport is Moab, UT (CNY-Canyonlands Field): 73-min drive, 71.6 mi/115.2 km.